Reasons You Might Want to Learn Japanese • To get by when visiting Japan. • To better understand Japanese culture. • To make new friends. • To watch anime without subtitles. • To live and work in Japan. • To work in translation. • To improve your brain and help prevent dementia in later life. How to learn katakana • Repeat the same methods you used to learn hiragana. • Learn to write your own name. • Practise writing English words in katakana. Vocabulary & Grammar • If you’re self studying then audio lessons and podcasts are your friend. • Beginner text books are a good source of basic Japanese and usually come with audio CDs. They’re usually quite wooden though. • Tae Kim’s Grammar Guide http://www.guidetojapanese.org/learn/ is an excellent overview of sentence structure. • Many people like Japanese Pod 101. Kanji • Pictographic characters adapted from Chinese. • Used to represent the meaning of words. • 2,136 "daily use" characters required for basic adult literacy! • Words can be made up of a single kanji, compounds containing two kanji, or combinations of kanji and hiragana. Kanji • Kanji are made up of "radicals", smaller components that make up a bigger picture. • Radicals have their own meanings, when combined they represent the meaning of a character, often in an abstract way. • Some kanji only contain a single radical and often share a meaning with that radical. Learning Kanji • Japanese children learn kanji by constant repetition. This is slow. • They learn characters with simpler meanings first, not simpler characters. • Many Japanese classes will teach kanji in this order, not expecting you to learn them. • There are better ways to learn kanji. Learning Kanji • Study the radicals as well as the characters. • Learn characters roughly in order of written complexity. • Practise hand writing but don't mindlessly repeat the same character. • When you learn new words try to learn how they are written at the same time. • Focus on learning key words for a character over learning all of its readings. • Used spaced repetition to recall characters just as you are about to forget them. Beginner Textbooks • Genki and Japanese for Busy People are two of the best known. • If you take a class they will probably follow one of these books. • They are okay when you know nothing but you should aim to move on to other materials. • Make sure you don’t use a romaji textbook. TextFugu • Online Japanese textbook specifically designed for self-study. • Focuses on motivation and study techniques as well as content. • The first few chapters are available to read for free but afterwards there’s a subscription. Remembering the Kanji • Guides you through all of the radicals. • Uses stories as mnemonic devices to recall kanji. • Assigns a single keyword to each kanji. • Doesn't tackle readings or vocabulary. WaniKani • Web app using a similar methodology to Remembering the Kanji. • Contains radicals, kanji and vocabulary. • Tackles meanings and readings • Splits kanji into 50 levels (plus 10 bonus levels). • Uses spaced repetition to quiz you at timed intervals. • Free up to level 3, paid afterwards. 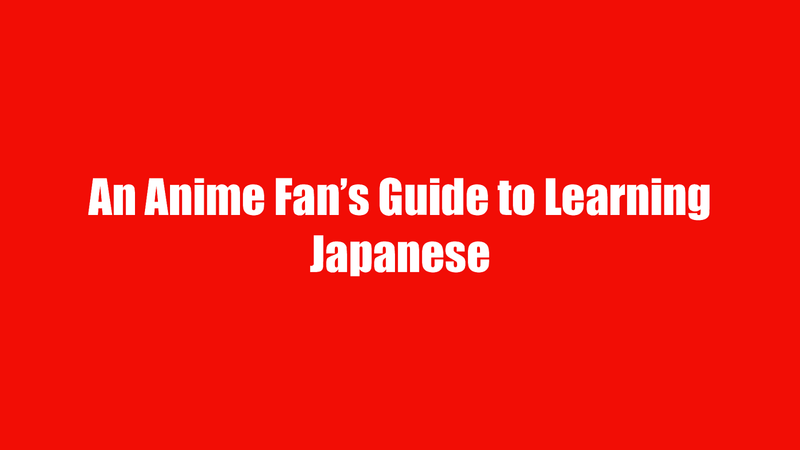 View An Anime Fan's Guide to Learning Japanese on Notist.